First Name: *This value is not valid for this field. *This field is required. Last Name: *This value is not valid for this field. *This field is required. Email: *This value is not valid for this field. *This field is required. Phone Number: *This value is not valid for this field. *This field is required. Age: *This value is not valid for this field. *This field is required. Height in CM *This value is not valid for this field. *This field is required. Hair Colour: Hair ColourGreyWhiteBlackBrownBlondeAuburnGingerBaldShaved *This value is not valid for this field. *This field is required. Eye Colour: Eye ColourBlueBrownGreenGrey/BlueBlue/GreenHazelGrey *This value is not valid for this field. *This field is required. *This value is not valid for this field. *This field is required. All job opportunities will be advertised on our webpage and posted on Facebook. Please make sure you check these regularly. When you confirm your availability, we will put you forward for every job you are suitable for. This will be on a first come, first serve basis, and the final decision will be made by the production team. If confirmed for a job we will contact you via email or text to let you know about this. You will be informed of call times and location as soon as we have received them. Please note these are subject to change at short notice. If you are offered work directly by a production company you will still be liable to pay Extras Casting commission for that job. The first 150 “founder members” of Extras Casting will benefit from a one off registration fee. If however a founder member decides not to re-register and then wishes to return at a later date, they will then be liable for the annual registration fee of £25. Registration will take place annually. An annual fee of £25 for registration and administration will be taken from your first wage. If you do not work within a 12 month period (from registration date), you will NOT be expected to pay this fee. We will deduct 17.5% commission from any payments from jobs secured by Extras Casting. We will endeavour to forward payment within 10 workings days after receipt of payment to Extras Casting. This may take longer in unforeseen circumstances. Contracts and payment can vary depending on production company. You may only be paid for the actual hours you have worked rather than that particular company’s day rate at the discretion of the production company. We acknowledge that our clients (SAs) accept and understand that any work position secured will be strictly on a self employed basis. As such the client will be responsible for making any statutory declarations or payments in respect of tax and national insurance due by the client as a consequence of this arrangement. Accordingly Extras Casting are instructed not to make any of these deductions at source without notifying the client. Please note, we do not guarantee work and cannot influence a production company to use us. If you have been confirmed for a job (you will have already confirmed that you are available) you must attend. It will be totally unacceptable not to turn up. If this happens for no genuine reason you will not be considered for further work. You will be representing Extras Casting and with this in mind we would like you to adhere to the following guidelines. Always be punctual. The production team will not expect to be kept waiting for SA’s to arrive, allow plenty of time for travelling and parking. On arrival always let the production team know that you are there. Please don’t expect them to know who you are, they are very busy. Please do not wear Logo’s, spots, stripes or designer marked clothing. It is advised that you take a spare set of clothing to ensure the costume department are happy with the choice you have made. 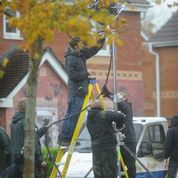 It can get very chilly on set in between takes and we therefore advise that you take a warm coat for this. You could be working outdoors all day. Ensure you have no evening commitments as you may be required to work late into the evening. With this in mind NEVER ask production crews what time you will finish, or can you finish early. Always be professional, never ask for autographs or take photos on set (even after filming has finished). Never discuss productions or story lines away from set. These are confidential and the programme you are working on may not be aired for several months. Please do not allow family or friends to accompany you on or off set. You may be required to work on location and the production company will expect only you to attend. Consumption of alcohol is not advised on set. Always allow cast and crew to have their lunch first as they have to get back to prepare for the next scene. There will always be enough food to go around. All mobile phones must be switched off on set. Any problems whilst on set please contact Extras Casting rather than the AD. Never leave set until the AD has confirmed that you are able to do so. Always make sure you have your chitty signed before leaving as this is your reference to payment. You may not get paid without doing this. We at Extras Casting pride ourselves on our SAs attitude and behaviour whilst on set. This ensures that the production companies are happy to continue working with Extras Casting, so please always be professional and enjoy your day. Good luck to Yasmin who is filming a commercial today. We hope you enjoy your day.